Sandown Castle was a low, stone artillery fortress, founded in 1539 by King Henry VIII. Built as the northern fort of a closely placed series of three, they guard the sheltered anchorage, of the Downs. Of similar design to Walmer Castle, its circular central keep, was encased by a series of four outer bastions, one serving as the gatehouse, they formed the curtain wall. 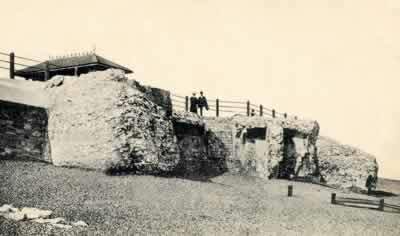 The sea breached the outer wall of the moat in 1785 but it was still fortified during the Napoleonic Wars. Largely demolished in the late 19th century, the remaining walls were incorporated in a concrete sea wall, constructed in 1989. A few loose stones, are all that are left to mark the site of the castle, a mile south is Deal Castle. Sandown Castle is located in North Deal, off Sandown Road. 9 miles north-east of Dover, on the A258.